Whichever way Grantham is approached, by road or by rail, St Wulfram's tower and spire can be seen dominating the town. John Ruskin, the Victorian writer and art critic, was so spellbound by the beauty of the spire when he first saw it, that allegedly he swooned. Simon Jenkins, in his book 'England's Thousand Best Churches' said, "Here is the finest steeple in England... Grantham's slender spire is one of the most exhilarating images of English Gothic." 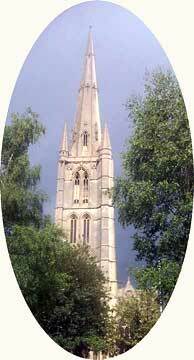 Follow the links below to learn the fascinating history of the tower, and spire of St Wulfram's.